For years – certainly since we moved to Fethiye in 2003 – Popeye’s boat bobbed and swayed about in the corner of Fethiye harbour, tightly roped so as not to float away in the currents flowing into the sea from the feeder canal. Every so often (some might say too often) we would climb into the boat and order the boat’s speciality, balık ekmek. Sometimes, low waters meant the step into the boat was more of a jump down. Other times, it was a step up. More than four customers and it was time to get cosy, shunting along the benches to make space for the new arrivals. Occasionally, someone would order ‘plate service;’ battered whiting on a plate with salad or fish and chips. But most of us were there for one thing; balık ekmek. Goujons of whiting, deep fried in a light batter before being served with rocket leaves, tomato and onion all nestled into a fresh Turkish half bread. Bliss! ‘All good things come to an end,’ as they say. And, sadly, the days of munching through a satisfying fish sandwich on Popeye’s, and neighbouring boat Cek, are over. It’s a happy memory for us – it’s been a significant part of our life in Fethiye…but now we continue into the future at Kırçiçeği Cafe. Dispanser is becoming a real little treat for the Turkish snack food fan. 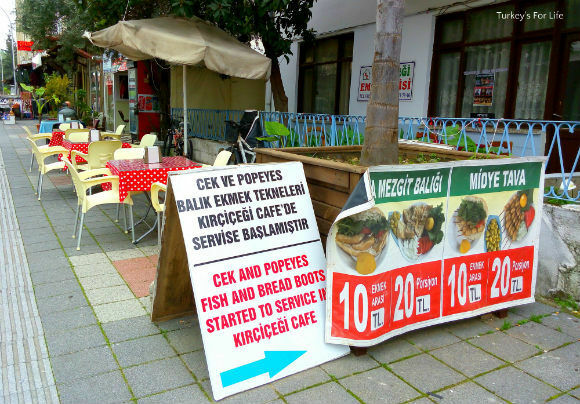 There’s all manner of börek joints; kebab places; one of our favourite lokantas, Yeşil Asma Yarağı is housed there; there are cafes selling regional foods – kumpir in Ortaköy style, Çeşme kumrusu, Hatay-style kebabs; and these days, you can’t have a neighbourhood that doesn’t have çiğ köfte on offer. So, yes, you can get that, too. There’s a fantastic köfte place selling nothing but köfte and their neighbours satisfy your sweet tooth with their famous lokma. And for the Turkish coffee fans there’s Gaffe. they serve up a specialised version of this famous drink. And now, to add to that eatery tally, Kırçiçeği Cafe has joined the Dispanser crew. What’s on the menu? Well, not very much – there never was! These are the best types of eateries. No menu to worry about. You’re coming here to eat deep-fried battered whiting (mezgit) or deep-fried mussels (midye tava). Take your pick! And you can have these served in a half bread. Or, you can push the boat out and go for plate service. There’s nothing upmarket about Kırçiçeği Cafe but that’s not what you’re here for. The guys have so much more room to work with than they did on the boats and they have room for more covers, too. And whilst it will never be the same to not eat your fish in bread whilst swaying about on the water, it still feels familiar. The place where we want to be. There’s a few places in Fethiye these days who are serving up balık ekmek. Some are better than others – depending on your personal taste. Lots of them are on the seafront. We’ve sat by the sea eating our fish sandwich…but it just didn’t feel the same. Guess we were always looking for that familiarity rather than embracing the new. And our first visit to Kırçiçeği Cafe gave us that familiarity that we realised we’d been looking for. This is the first part of the familiarity. Sitting down at your table and getting yourself set up. ‘Getting yourself set up,’ entails putting the ever present bowl of pickled chillies into the middle of the table. The lid is removed in preparation – one small chilli per bite of sandwich – and the tongs placed in the bowl. A quick prod and stir, too, just to make sure all the chillies are coated in their salty vinegar. Yes, perfect! Two balık ekmek with everything on – crisp green rocket leaves, thinly sliced half moons of raw onion and slices of fresh tomato, a good dose of salt and a drizzle of lemon juice. Confirming ‘two’ to our host, confirms all of that. How can we ever be disappointed with the arrival of ‘fish in bread’? A glass of steaming hot çay is brought to the table and then the sandwich arrives. We love a çay (Turkish tea) and always said Popeye’s was one of the best. That çay satisfaction has also been transferred to Kırçiçeği Cafe. As has the fish in bread familiarity and satisfaction. No changes. Everything still as simple – and all the more delicious for it – as it always was. That familiarity could well disappear on our next visit, however… I love midye tava and just might pry myself away from the desire to order a balık ekmek. Well, we all need a little change every now and then. Don’t we? 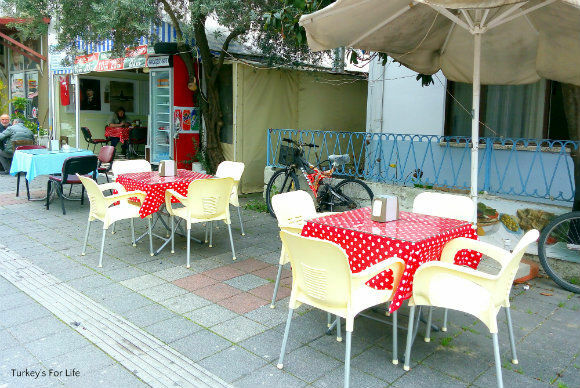 Kırçiçeği Cafe is on 502 Sokak in the Dispanser area of Fethiye town centre. Dispanser is the pedestrianised grid of streets behind the town square and Uğur Mumcu Park. Kırçiçeği Cafe serve whiting (mezgit) and fried mussels. You can either have them on a sandwich or served on a plate with accompaniments. The cafe is open daily, year round. 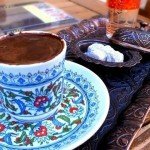 We have added Kırçiçeği Cafe to our list of options for where to eat and drink around Fethiye. 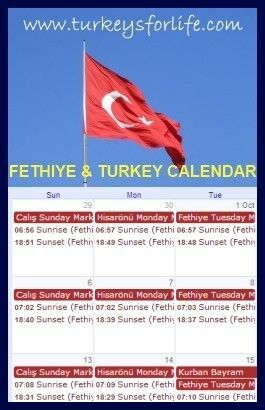 Changing Fethiye: The New Centre? Is it because we were brought up on fish finger sandwiches that we love balık ekmek so much? The boats are still there but the guys have joined forces to open Kırçiçeği Cafe just round the corner. We guess, for whatever reason, the boats can’t trade anymore.